Kingyo-sukui is a traditional Japanese children’s game from the Edo period which is often found at local summer festivals. 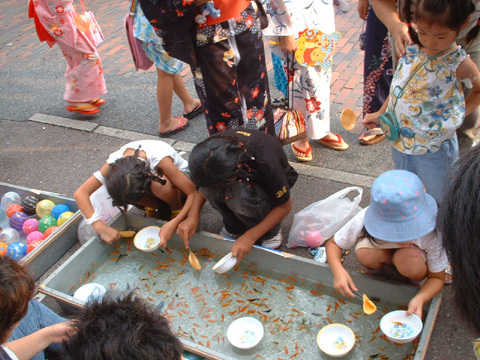 In the game, each player has to try to scoop out as many goldfish from the pool as they can, using a paper scooper called a “poi” (ポイ). 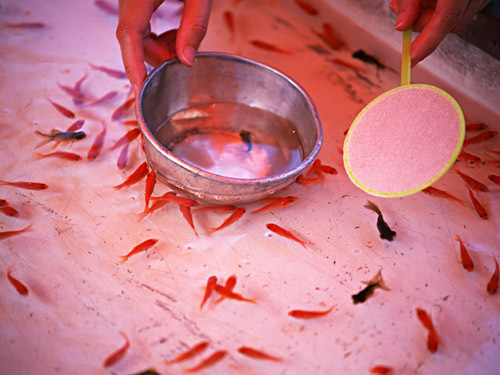 The poi is very thin and, when it tears so much that it can’t be used, the game is over and the player gets to take home the fish they have won in a plastic bag. To play the game you usually have to pay ￥100 or so, and often the stall-holder will give you a goldfish even if you don’t do very well. 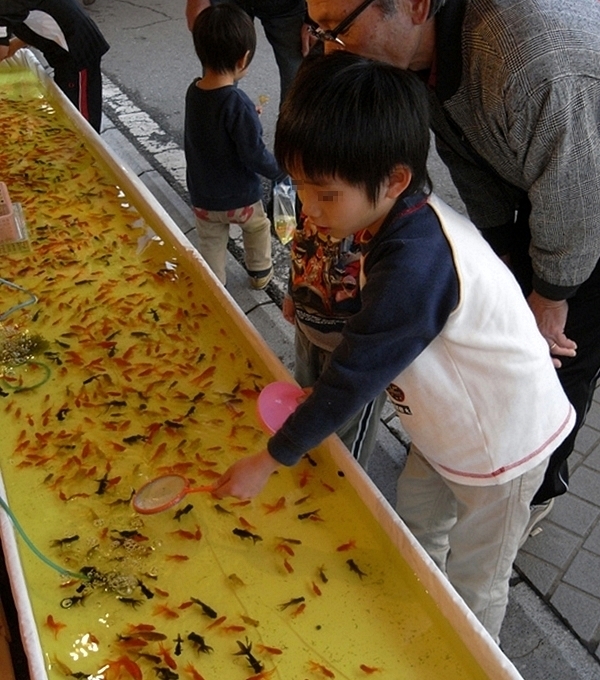 In 1995 the National Goldfish Scooping Championship (全国金魚すくい選手権大会) began, managed by managed by the National Goldfish Scooping Association and Yamatokōriyama City in Nara Prefecture. Yamatokōriyama is famous for producing goldfish, and you can read more about that here. Along with watermelon, Japanese fans, yukata (summer cotton kimono), kakigori (shaved ice) and fireworks, kingyo-sukui is one of the things most Japanese people would associate with summer. Local festivals in Japan are really worth checking out if you have the opportunity, as you usually have the chance to sample the local culture and traditions, and see “real” Japan. I remember seeing this game a number of times at small local festivals in Japan but, amazingly, I never took a photo of the game being played. So, I’ve had to search around on the Internet, and borrow a couple of images (which I hate doing). All sources are referenced below the images. Thanks for the mention. Kingyo-sukui is perfect for the summer. Why didn’t I think of that! Young children love playing this game during festivals and it is a lot of fun. Have you tried it yourself? A few suggestions for next week include ika (squid) ika sumi pasta, Iga (the home of ninja), ikebana (flower arrangement), and two of my favourite sights in Japan – ise-jingu and inuyama-jo. I second Iga, as it tied with the sumo for being my favourite day in Japan. I wish I’d been more on the ball on the fourth (!) train to get there as it went through a beautiful valley but I didn’t take any photos. The ninja museum was brilliant fun and I dressed up as a warlord in the castle. I have photos if you need any!